While many thought that it was possible for Bradley Roby to fall out of the first round, the Buckeye cornerback ended up being the selection of the AFC Champs at the 31′s pick overall. Following a season that even he identified as disappointing and included two minor off the field incidents, Roby can’t help but be excited for the chance to earn a spot with a Super Bowl contender. And we know that he’s gotten used to the snow. You can check out this and other great coverage at Yahoo!’s “The Postgame“. I am really enjoying where this article takes me from week to week because I have the ability to pretty much say whatever I think about certain topics. At times I have obviously been agitated while writing it and have chosen to leave out Bumblin’ this week. Staying as positive as I can about our Buckeye topics, or Ohio as the case may be. Let’s get rolling with the good! You have to be happy, as fans with the current state of affairs for all professional sports in Ohio. Yes, the Cavaliers season didn’t end well and left a lot of people wondering if Irving was still gonna be around next season. There are some issues there that some fans feel that only Lebron James can fix. My position with this is he isn’t coming back and if he did, what makes fans think he can do it by himself when he couldn’t do it before. Like I said, more issues than just one player. Thats about as negative as I will be today because there is soooo much good. We have fans in the great state of Ohio who will support just about any of the teams. The Columbus Blue Jackets single handedly converted thousands of fans to hockey and they appear to be here to stay, finally for those who have been fans from the get go! Those who support the two NFL teams have an opportunity to be excited for whats on the horizon, and the upcoming draft is no different. Both teams have an opportunity to supplement two already pretty decent rosters and the Browns in particular will make a giant leap. The battle for the North may actually take place two times in Ohio this season and only time will tell. Baseball is in full swing and although neither is leading their division, both teams have fan bases that are more passionate than any other in MLB and would love nothing more than seeing each other in a World Series some day. That won’t happen this year, but it could some day. The fans in Cleveland love the players and really love Terry Francona and what he brings. The Redlegs are in a transition of styles in coaching. Bryan Price hasn’t won over the fans just yet, but it’s pretty clear he has faith in the pitchers he’s helped develop by leaving the ball in their hands, and his aggressive style should take hold as the season moves along. Well, another Senior Crawl has come and gone in Columbus and we get ready to celebrate with the graduates of the Ohio State class of 2014 (including our friend Janelle!). You can’t think “graduation” without today’s soundtrack, I’m guessing… and we’ll give you the version that features yet another great Ohioan. Lesser Charges- The story of the day on Tuesday was Bradley Roby’s decision to plead to a charge lesser than the OVI that he was initially confronted with, and accept a sentence of $375 and a three day driver’s intervention course. Given what came out regarding his field sobriety test and an anonymous call the night of the incident, it may be a good thing that this wasn’t pressed further. Whether or not this impacts his draft status is yet to be seen. Getting Drafty- If you’re the type who likes projections and that type of thing, here’s a look at LaQuinton Ross’ skills as the NBA process nears. I’m not a guru, but this seems to be pretty dead on. June N00b- Former Crimson Tide Chad Lindsay will be getting a jump on things and will be enrolling at Ohio State in June- just in time for the voluntary (wink wink) workouts. Two Hats And A Sweatervest-Jim Tressel is in the top three at for the presidential searches at both Akron AND Youngstown State, making for a really awesome potential “selection ceremony” if the schools would chose to go the NLOID route. Another option would be to have the selection via American Idol type announcement or even one a bit more dramatic. Wither Wimbush? I try not to pay much attention to the whims of 17 year old adults, but there’s been a lot of frustration regarding Ohio State’s current recruiting successes. Most recently, one time “strong lean”QB from New Jersey seems to have fallen out of love with Ohio State, looking instead at Penn State as a strong possibility to “take his talents to”. It will be interesting to see if the other PSU news from Tuesday (see below) has any impact on the James Franklin’s mystique. Wrasslin’- It’s almost as awesome as Mr. Poffo (mentioned above), but there will be some Buckeyes who hit the big stage as a part of an exhibition match in New York City. I check in with you this week with only a little about the Buckeyes and it’s not that good. We’ll also touch base(once again sigh) about fan base actions that disappoint. I want to throw out a S/O to my good friend Michael Doty Sr. for hitting a grand slam earlier this week with his guest article about offensive needs for the Buckeyes. He told it like it is and said what everybody was thinking, IF Braxton goes down to injury, the Buckeyes are in serious trouble. We better hope it happens early in the conference season. Let’s get started with the really good for this past week. I am not a hockey fan in the sense that term is meant. I will support the Columbus Blue Jackets simply because they are a professional sports team in Ohio as I have at some point rooted for all of them at some point in my life because it’s the right thing to do as an Ohio guy. I will be honest and say that I haven’t been a fan of the Browns since Pruitt/Sipe/Rutigliano days and have my own issues being a fan of the Bengals obviously. In football, it’s really difficult to support both of them and as of late, there hasn’t been much of a Browns Bandwagon rolling. Enough about me, let’s discuss what the CBJ have accomplished, and what they’re meaning to the city a lot of us love! The series is tied 2-2 headed to game five in Pittsburgh on Saturday and has been an amazing round of hockey. Every game so far, the losing team was up 3 goals to 1 and wound up losing 4 – 3. CBJ has won their first two playoff games in dramatic fashion and has made two of Pittsburgh’s better players look silly in both. The fans have been remarkable and they have taken it to a whole new level because there is a large seething hatred for anything in Pittsburgh for just about all sports. Like the rest of Ohio, we’ve got Stanley Cup fever here… we’re on a series of shots and medications, but to be honest, we hope it sticks around for a while. So, in preparation for tonight’s game, here’s a little something to help you get ready to #BeatPittsburgh. The League- Pretty good week for Buckeyes in the NFL, as Cam Heyward’s 5th year option was picked up by the Steelers. This comes one day after Terrelle Pryor was traded from the outhouse to the penthouse the Raiders to the Super Bowl Champion Seahawks. Rumor across the league were that the 49ers and ‘Hawks were both pursuing Pryor diligently, with Pete Carroll finally winning the day. Good luck in the Emerald City, Terrelle… be sure to pay for your doughnuts, m’kay? Next Men Up- NFL news on Tuesday also included Draft Day invitations… and not to the latest Costner flick. Bradley Roby and Ryan Shazier will both be in New York City; here’s hoping that neither win the Brady Quinn Sitting Around By Yourself For A Really Long Time Award. 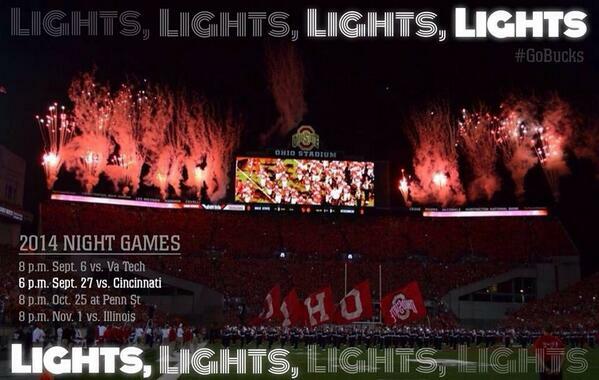 Night Moves- Ohio State added a fourth night game and a third one on the 2014 home slate on Tuesday, when the BTN announced that the intra-state tilt against Ohio’s BCS Team would be under the lights in the ‘Shoe. There’s still the possibility that the number could grow- the game in East Lansing might just be pushed into prime time if both the Spartans and Buckeyes have the seasons most are projecting. Flippity Flop- Over the weekend, Ohio State “lost” one of their 2015 recruits, as Ben Edwards followed up his “soft verbal” comments to North Carolina by giving his verbal to the Auburn Tigers. As you can imagine, this unleashed the highest in philosophical and intellectual debate among some Ohio State fans… many of whom are way too emotionally invested in the lives of 16-17 year old boys to be healthy. One question, though… Would you as a fan rather that the staff pursue in-state kids that are sure to be 100% Buckeye but may not be the caliber of other recruits, or would you rather that they continue to pursue out of state players who may not end up in Columbus but could make a bigger impact? I look forward to your answer in the comments; be sure to show your work. There was a relatively serious altercation involving McKinley quarterback Eric Glover-Williams and another McKinley player during the school day last week at the high school. New McKinley football coach Thom McDaniels declined to comment on the situation, other than to confirm there was an altercation between Glover-Williams and a player who is a senior. Interim President Senator? Hey, guess who’s a finalist for the top position at Akron? That might just be the coolest thing to come out of the Rubber City this summer… well, almost. 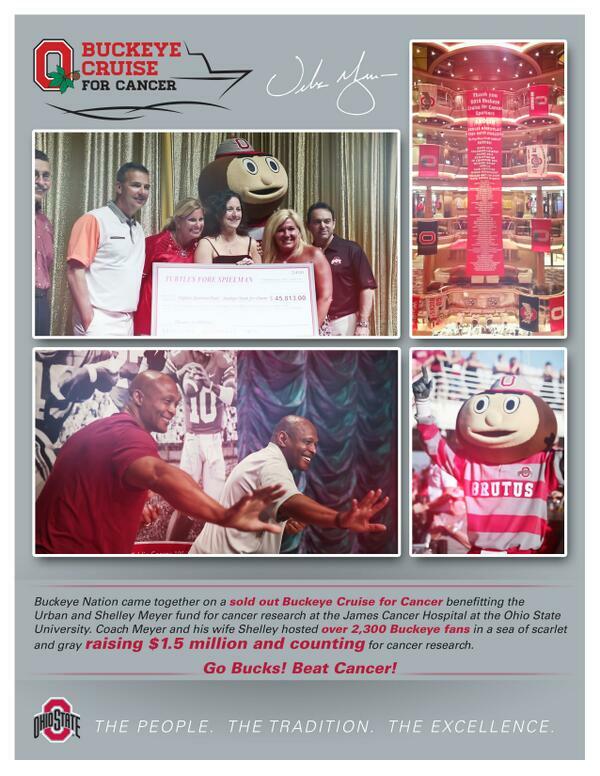 Paying It Forward- It’s always a good time to do a good thing… and it may just end up helping the Scarlet and Gray as well as saving a life. We lost a great one on Monday, and another iconic figure on Tuesday. Today’s soundtrack hopes that these guys are both on a better path, if you can dig it. Birthday Wishes- Belated, sure, but happy birthday to Aaron Craft and Michael Bennett… I’d love to be a fly on the wall for a combined party for those guys. Combined Excellence- The “big show” in Indy this past week saw the Scarlet and Gray represented well. Ryan Shazier set the bar (at a heavier weight) for the vertical jump, and Bradley Roby ran a sizzling 4.39 40 yard dash. Carlos Hyde struggled in the lifting measures and pulled a hamstring on his 40, Corey Brown’s unofficial 4.37 40 was exciting for Ohio State fans to watch, and Corey Linsley managed 36 reps on the bench test, which was among the best at his position. More Roby- B-Rad made news earlier in the week when he acknowledged not working as hard during his early season suspension, which cost him on the field (in his opinion). He also talked some about his belief that football players at major programs should see financial compensation, and compared his last two seasons to being an NFL-like experience. Gettin’ Paid- Along those same lines, several former Buckeyes weighed in on the idea of college players getting compensated. Kirk Herbstreit spoke about the immeasurable intangibles of an Ohio State/College experience, while Robert Smith and Joey Galloway took positions that seemed to support the players’ cause. Our friend Jeff Svoboda also got Urban Meyer’s take on the matter... really interesting reading, given where this seems to be headed. Gettin’ Ray’d- Oh, Ray… we had such higher hopes for you. Well, maybe “higher” was a poor choice of verbiage there. Friday Night Lights? While Ohio State hasn’t weighed in as of yet, the conference’s leadership is exploring football on Friday Nights in the future. I hate it, and hope that it never happens, but I understand it: more programs need exposure, BTN needs content. The problem, as I see it, is that this continues to push fans toward television as their primary resource for the sport at a time where attendance is waning and Universities need butts in the seats to pay the bills. Dy-NASTY! 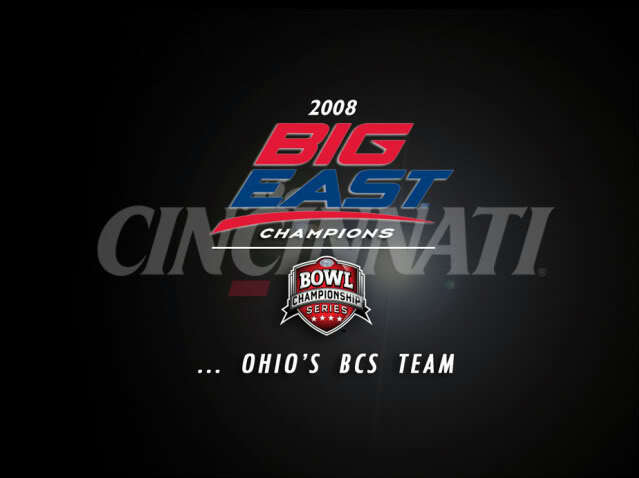 Quick, what Ohio State team has not lost a conference contest in nine years? Yup, your NCAA Indoor Champion Tennis program… that’s a lot of net-jumping.